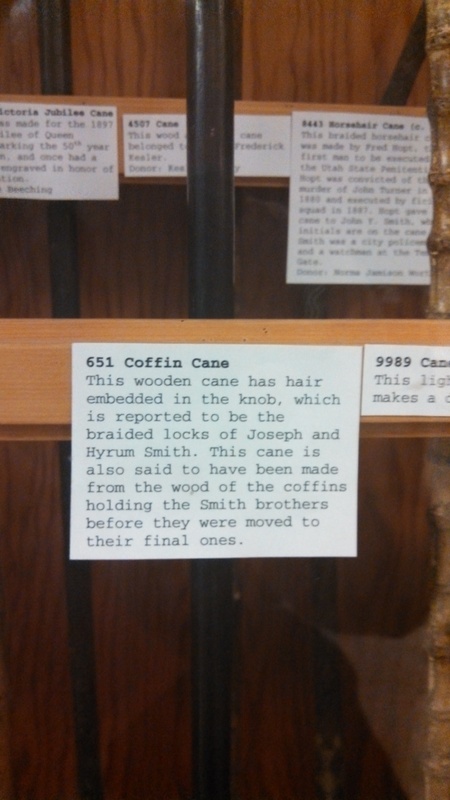 When I was a wee lad, I heard about canes being made out of the caskets that carried Joseph’s and Hyrum’s bodies. I believe it was mentioned in passing by a tour guide at Nauvoo, back before every word stated was dictated by correlation. This passing comment stuck with me, for whatever reason, and I remember playing as a boy with my action figures having magic sticks that would heal them. When reading Harry Potter, the wands with unicorn hair or phoenix feather cores instantly reminded me of the casket sticks I heard about in Nauvoo. It’s the cane that chooses the wizard, Harry Potter. Then, our family traveled again to Nauvoo and Independence, Missouri, and again I heard of the famous canes with braided hair of the dead prophet and his brother in their core. I determined I would have to see one of these before I died. Well, now I have seen them, and a whole lot more. Hang on to your sorting hats, we’re entering the wizarding world of Joseph Smith, Jr. When the prophet died, they took one of the caskets that he and Hyrum were carried in, and split it up into walking sticks. Rumor has it that twelve of these walking sticks were made, and I think I’ve tracked down eight of them. They were oak sticks with Joseph/Hyrum hair core, and purportedly had magical powers of healing. Willard Richards, Heber C. Kimball, Dimick Huntington, Wilford Woodruff, Brigham Young, Perrigrine Sessions are all known to have owned one. 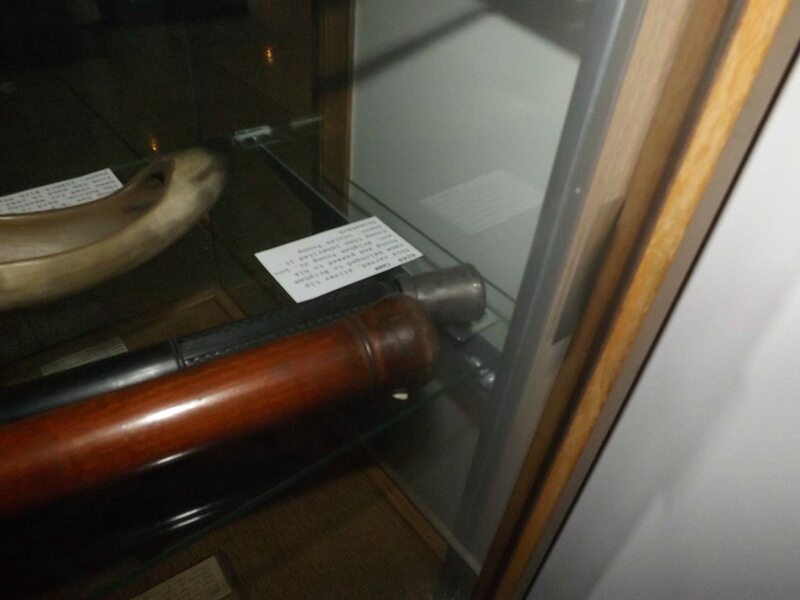 Joseph Bates Noble, the prophet’s bodyguard who received the Nauvoo legion sword from Joseph, also received a casket stick, and I believe it is his stick that is prominently displayed at the UDOP Museum. Emma’s walking stick also looks to be one of these casket sticks. Oliver Boardman Huntington’s journal records the following about the Dimick Huntington cane in MS, Book 18, pp. 62–64, Archives and Manuscripts Department, Harold B. Lee Library, Brigham Young University, Provo. I had with me a cane made of the rough box hastily nailed together into body which the Prophet Joseph Smiths ^ was placed after he was murdered and brought to Nauvoo from Carthage. In the top of the cane was a lock of his hair which was taken from his hed his head after he had been buried 7 months. My brother William took it off as he and my brother Dimick were moving the bodies of Joseph and Hyrum from where they were ﬁrst buried, in the cellar of the Nauvoo House, to the cellar or pit under a little outhouse that was built exclusively for that purpose. The glass over his face was broken and they saved some of that glass And a piece of that glass covered the hair in the top of the cain, and then a piece of metal with a round hole in the center was over the glass and hair. Through the hole in the metal (aluminum), the hair could be seen. At the party on that evening the cane and its history became known and was viewed, inspected, admired and handled by each individual, and was constantly on the move until 12 o’clock at night. I was invited to give a history of the cane and of the burial and reburial of the bodies of Joseph and Hyrum Smith, which I did. The cain came into my possession in this way. It was my brother Dimicks cane in the ﬁrst place. The whole box that Josephs body was brought to Nauvoo in was sawed up into strips suitable to make walking canes of and divided out among his special friends. 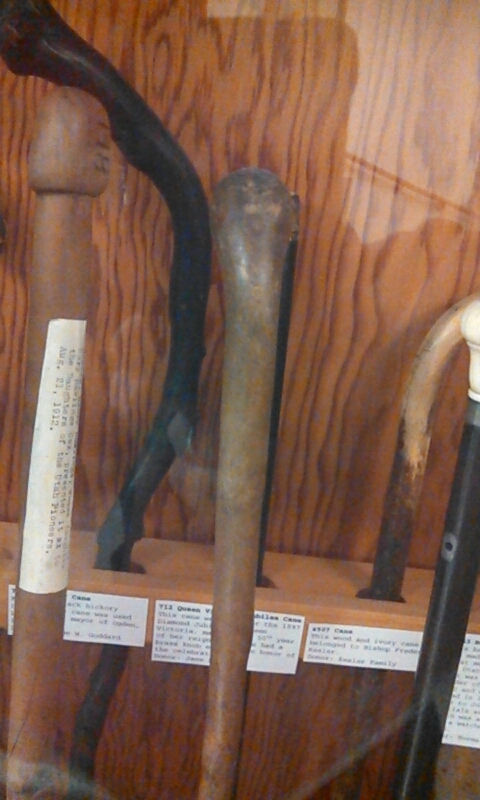 After the death of Dimick the cane became Allens, and he told me to take and keep it until he called for it. He died without calling for it at all. Before leaving Nauvoo, he paid a visit to Emma Smith to whose life he sought to bring consolation in the hour of her bereavement. She gave him a piece of oak for a staff. The oak had taken from Joseph Smith’s cofﬁn. My purpose in getting it was that I might put a part of each of these collections in the knob of my staff as a relic of those noble men, the master spirits of the nineteenth century. Joseph Smith’s body may have placed in as many as three different cofﬁns in 1844. These would be the rough oak box he was placed in at Carthage, the outer cofﬁn used while the body lay in state at the Mansion House (which was then ﬁlled with bags of sand and buried at the cemetery), and the cofﬁn in which the body was buried secretly in the basement of the Nauvoo House (see B. H. Roberts, A Comprehensive History of the Church, 6 vols. [Provo, Utah: Brigham Young University Press, 1965], 2:293). “Brother Heber, here is a rod (putting it into my hands) with which you are to guide the ship. While you hold this rod you shall prosper . . . and the hand of God shall be with you.” In the dream the promise was fulfilled by the ship’s knifing through all obstacles. At a Relief Society Meeting held Apr 28, 1842, I heard the Prophet Joseph make this statement. While other leading men of the Church have been unrighteously aspiring, Heber C. Kimball has been true and is to me what John was to Jesus, my beloved disciple. 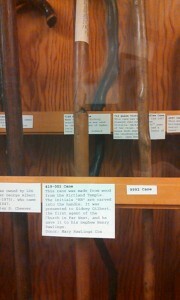 Brother Kimball showed me a rod that the Lord through the Prophet Joseph had given to him. He said that when he wanted to find out anything that was his right to know, all he had to do was to kneel down with the rod in his hand, and that sometimes the Lord would answer his questions before he had time to ask them. My mother and my sister, Helen Mar, told me the same thing and added to it, that Pres. Young received a similar rod from the Lord at the same time. They claimed that these rods were given to them because they were the only ones of the original Twelve who had not lifted up their heels against the Prophet. My mother and my sister, Helen Mar, told me the same thing and added to it, that President Young received a similar rod from the Lord at the same time. [H]e went home and used the rod. I got a witness Elder [Willard] Richards would live–that we would overcome our enemies. I inquired by the rod. It was said my family was well, that my wife would come to me in the east, and that Congress would not do anything for us. How did Heber inquire of the rod? Heber C. Kimball clothes himself in endowment robes prays in the “True order” while holding a divining “rod” and asks yes-no questions. Movement of the rod means “yes” and no movement means “no” (Entry June 6, 1844 recorded in Selected Chronology of the Church of Jesus Christ of Latter-day Saints, 1830-1847). The same evening I sat down in my house in the presence of my wife and inquired of the Lord by the rod as follows: If we should finish the temple–it was verily, yes. That my sins were forgiven and that I should overcome and get my appointment of my inheritance while in this probation. And that the temple committee were not enemies to the Twelve Apostles. boxes, so has Brother Brigham and a great many others, and we prize them highly and esteem them a great blessing. I want to carefully preserve my cane, and when I am done with it here I shall hand it down to my heir, with instructions to him to do the same. And the day will come when there will be multitudes who will be healed and blessed through the instrumentality of those canes, and the devil cannot overcome those who have them, in consequence of their faith and conﬁdence in the virtues connected with them (Heber C. Kimball as quoted in Life of Heber C. Kimball by Orson F. Whitney). In like manner I have sent my cane. Dr. Richards used to lay his old black cane on a person’s head and that person has been healed through its instrumentality, by the power of God. 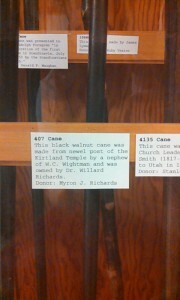 I believe a photo of Willard’s cane, mentioned here, is below. 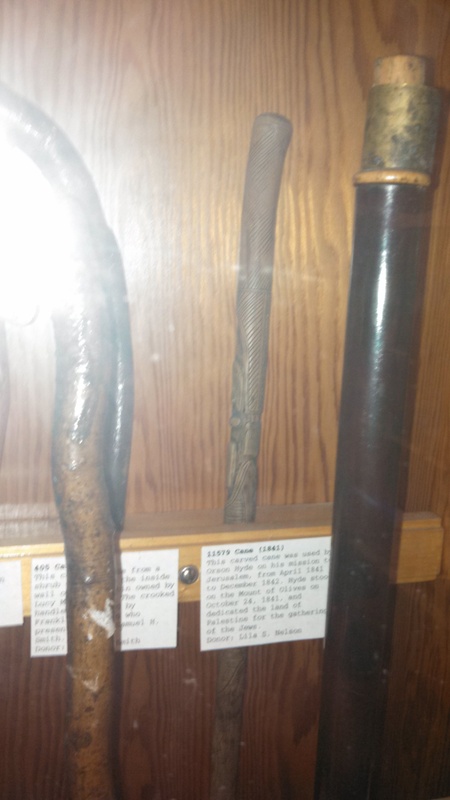 Heber’s cane went from Abraham Alonzo to his son, Abraham Alonzo Jr. The Kimball family is still in possession of it. A second claim to possession was made in June of 1945, but this cane does not have the little window in it. The descendants of Tee David Patten Kimball claim it went from Heber to David Patton, then to Heber Chase Kimball. He, himself, said, “Since I was eight years old I have had in my possession the cane. I received it shortly after my baptism into the church. On the handle of the cane is engraved the name Heber C. Kimball. It has all the virtues and power which have been referred to and it will yet be the means of blessing and healing thousands as recorded in the history of my Grandfather Kimball which was written by his grandson, Orson F. Whitney…” (Minutes of a Meeting Honoring Heber C. Kimball and Thomas S. Williams, June 14, 1945 6-9, copy in Utah State Historical Society, Salt Lake City). The last recorded prayer “by the rod” took place in 1862, according to D. Michael Quinn. There is no evidence of continued use by the leadership of the church after Heber died in 1868. Emma’s walking stick resembles all the other casket sticks. Although we couldn’t take the top off and see if there was a little window to confirm. Oliver Cowdery and Brigham Young: Dowsing the temple. When Oliver Cowdery took up his duties as a scribe for Joseph Smith in 1829 he had a rod in his possession which Joseph Smith sanctioned… (Marvin S. Hill. Dialogue. A Journal of Mormon Thought. Winter 1972, p. 78). In the revelation to Oliver Cowdery in May 1829, Bro. 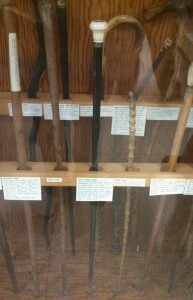 [B. H.] Roberts said that the gift which the Lord says he has in his hand meant a stick which was like Aaron’s Rod. It is said Bro. Phineas Young [brother-in-law of Oliver Cowdery and brother of Brigham Young] got it from him [Cowdery] and gave it to President Young who had it with him when he arrived in this [Salt Lake] valley and that it was with that stick that he pointed out where the Temple should be built. [Brigham] Young selects the site of the Salt Lake Temple by using Oliver Cowdery’s divining rod. A look from the rear. This cane differs from all the others in a particular way. 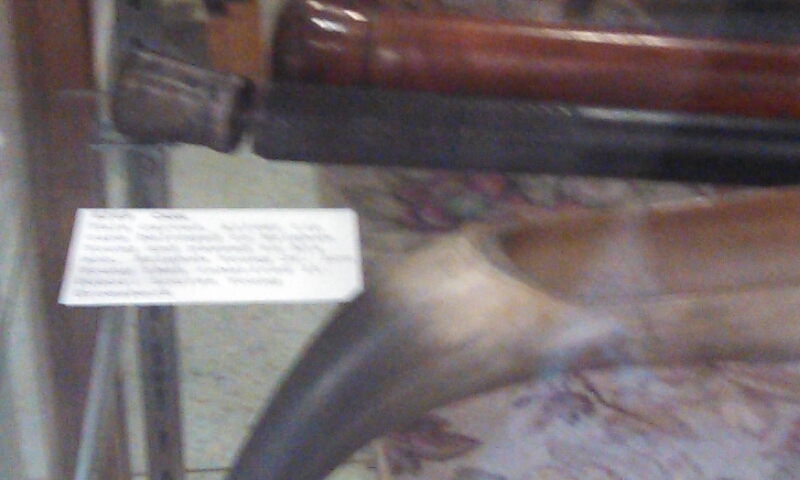 It is black, not oak or metal, and has a silver top put over the top of the cane. I read once a description (that I can no longer find) of Oliver’s dousing rod. It was described as “black.” This walking stick was also shorter than Brigham’s other walking sticks. I don’t know if Oliver was shorter than Brigham, but, if so, this may indicate that this is THE stick Phineas Young gave to Brigham and was used to point out the temple lot via dousing. An apologist states, “It should be noted that Cowdery was probably not a hazel rodder. He seems to have had a staff.” He gives no source and no further discussion on how he comes to this conclusion. Perhaps he had access to more info in the vault? Oliver was excommunicated in 1838, about the time Brigham and Heber received real rods from Joseph, meaning before the casket sticks were made (as Joseph would have been dead). They received their casket sticks from Emma. Heber is reported using this rod in 1844. The Kimball family has no idea where this rod is, but perhaps it was the one owned by the A. A. Kimball line discussed above. 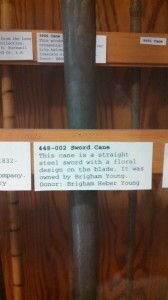 We found the cane spoken of by Orson at the Utah Daughters of Pioneers Museum. 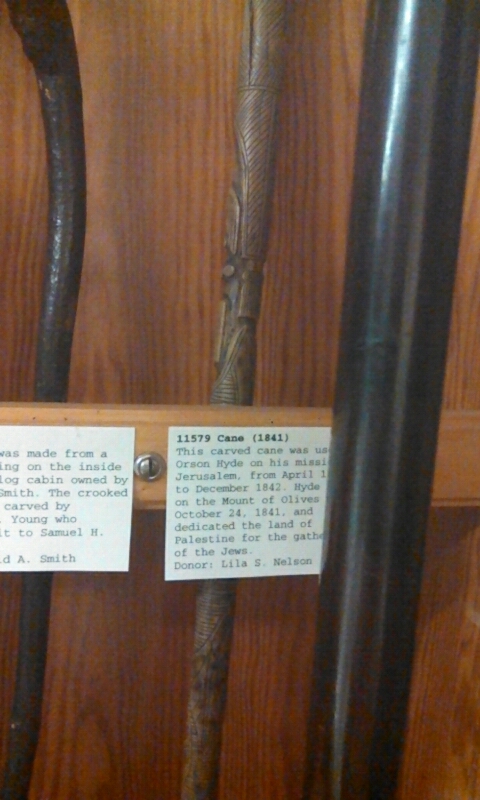 This carved cane was used by orson Hyde on his mission to Jerusalem. James C. Brewster publishes his claim that, as part of an 1836 Ohio treasure-quest, Presiding Patriarch Joseph Smith, Sr., “anointed the mineral rods and seeing stones with consecrated oil, and prayed over them in the house of the Lord in Kirtland” (Quinn, D. Michael, The Mormon Hierarchy: Origins of Power, Appendix 7: Selected Chronology of the Church of Jesus Christ of Latter-day Saints, 1830-47). 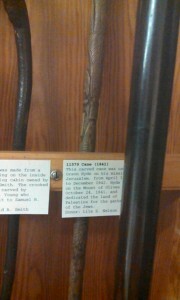 This cane was made out of a piece of the Kirtland Temple, it says, but perhaps it was simply blessed in the Kirtland Temple. After all, the Kirtland Temple still stands. Parley P. Pratt’s autobiography carries an illustration of Willard Richards holding his cane, which looks similar to the Huntington cane. Enlarging the image in The Restored Church makes this clearer. The caption calls this his “Kirtland Temple Cane,” but it resembles the casket sticks. I’m not sure which it really is. Do the rods really work? 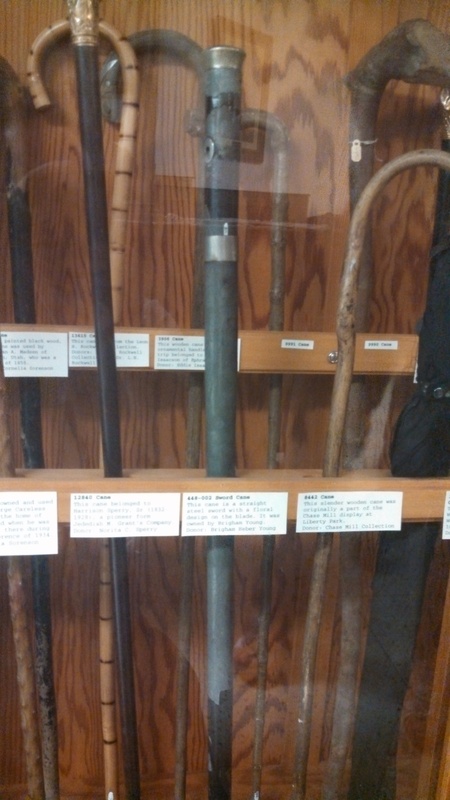 TL;DR: Mormons really believed in magic sticks, like wands in Harry Potter. Several of these are on display in the Utah Daughters of Pioneers Museum. 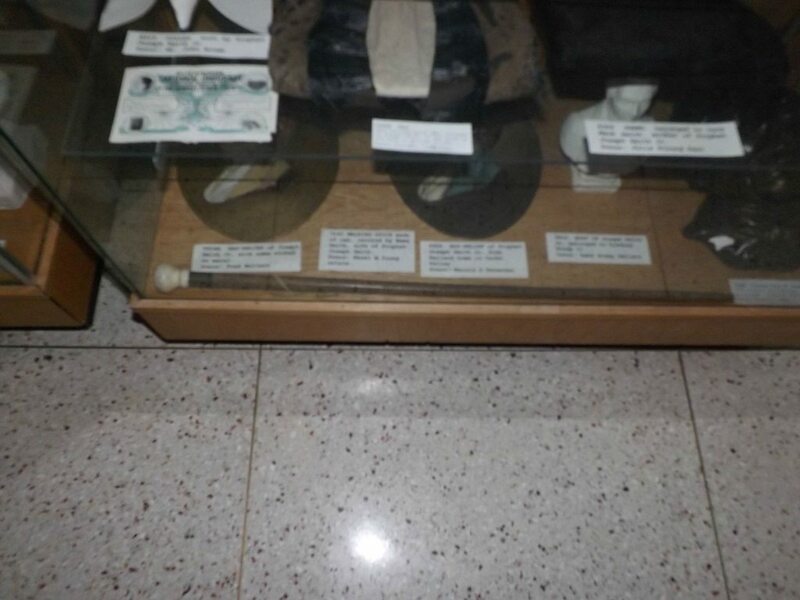 Images in this post come from a tour of that museum. One such walking stick, listed here, might even be the dowsing rod used to select the location for the temple. This entry was posted in Early Church History (1800s). Bookmark the permalink. Which bit is the lying bit? It is not beyond belief that these early pioneers used similar objects of faith. But now, with science, we can empirically test each of these claims and so far, not a single one of them have been magical. So they used them, but we should admit to ourselves that they were not objects of faith, but objects of deception. As soon as you have a peer-reviewed, scientifically tested magic item; I’m happy to recant. Until then, I say they were a superstitious people we shouldn’t want to emulate in what they placed their trust in. Not that I disagree with you (and thank you for your work, just by the way), but I feel like a majority of “faith objects” used some extent of the placebo effect. People thought they were magical healing instruments, so they worked. That can’t really stand up to scientific scrutiny, and it may be the explanation. Do you believe that you found Oliver Cowdery’s divining rod? The picture is blurry and you don’t sound convinced. What does the card say? Did you ask anyone at the museum about it? I’d say it’s a 40% likelihood. I’ve been there several times since and there’s no real confirmation. It matches the description and there are no other canes, but how could one be sure without taking the top off and checking, ya know? I think I’m going to mention this when I teach D&C 8 on Sunday. Thanks for your research.